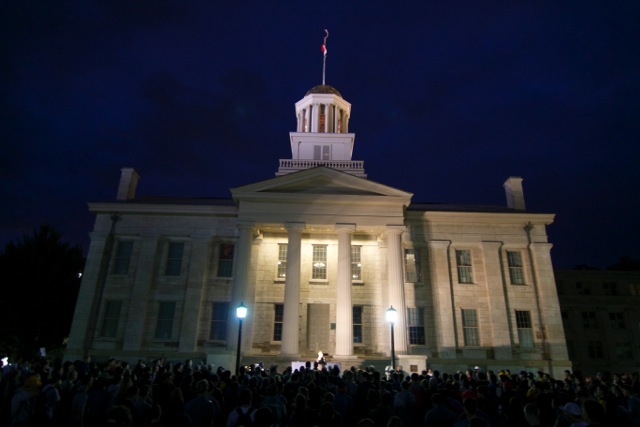 Rand Paul’s Whirlwind Iowa College Campus Tour Hit Themes Students Liked, But Did It Work? A common form of free speech at college campuses in 2015: presidential campaigns. This crowd gathered in front of Old Capitol at the University of Iowa to hear former Republican candidate Rand Paul speak on Oct. 12, 2015. Sen. Rand Paul’s recent swing through 11 Iowa college campuses this past week was a reminder of how important some presidential candidates view the next wave of voters. The value of these campus stops are supported by Pew Charitable Trust research that showed that voters ages 18 through 29 gave Barack Obama the boost he needed in 2008 to win the White House and 2012 to stay there. Sen. Rand Paul (R-Ky.) brings his Republican presidential campaign to Cedar Falls and the University of Northern Iowa on Oct. 13, 2015 during a three-day, 11-campus swing. Voters in that age bracket note only supported him by a 2-to-1 margin but helped make up for Obama loosing support in 2012 from voters 30 and older, the Pew report said. “We’re trying to bring as many candidates here to Storm Lake, Iowa, so that’s our goal for this semester,” Chase Werden, College Republicans vice president at Buena Vista University, said after Paul visited that campus on Wednesday, Oct. 14. Earlier, Paul, a U.S. Senator from Kentucky seeking the Republican presidential nomination, told about 40 students, faculty and staff in the university’s Dows Conference Center that he wanted to show students their votes matter. The topics he chose to make his points were privacy, national debt, the price of education, going to war overseas, legal marijuana use and a status quo in Washington, D.C., he said he wants to change. That kind of talk was resonating with many in the audience. 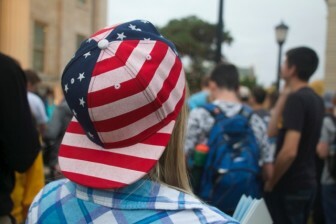 A spectator waiting to hear Republican presidential candidate Rand Paul speak on the University of Iowa Pentacrest on Oct. 12, 2015. Paul also tried to connect on the campuses with style points: selfies and pictures taken with the candidate in front of a ready-made backdrop were available at each stop. The locations changed but the photos didn’t, except for the Iowan in the pose. Also available were live streams of his stops and downloadable apps for his campaign. The caucuses’ timing next February have made reaching college students more important that in the last two presidential election cycles, when caucuses were held in January. 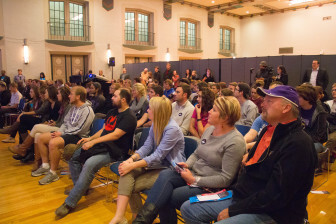 “In 2008 and 2012, college wasn’t in session for the caucuses,” Cliff Maloney Jr., youth director for the Paul campaign, said on Tuesday, Oct. 13, during the University of Northern Iowa portion of the Iowa swing. Paul remained consistent in that Cedar Falls stop, saying his plans for fiscal responsibility in the federal government, limited government in domestic and foreign policy and the protection of individual rights are grounded in a strict adherence to the Constitution. “That’s what the Constitution is about; it’s about binding the government in the chains of the Constitution,” Paul said. The audience during Sen. Rand Paul’s campaign stop at the University of Northern Iowa on Oct. 13, 2015. Much of his speech at Northern Iowa was devoted to foreign policy as he argued that sometimes the United States should remain neutral, a comment that drew applause. He said the fall of dictator Saddam Hussein of Iraq and Muammar Gaddafi of Libya caused instability in that portion of the world, which shows how decisions to topple dictatorships were mistakes. “So you ask yourself: ‘Which are we better off with, a strong man like Gaddafi in power … or say that we want democracy for those people so we have to get rid of tyrants so they can vote for what they want?” Paul asked. “I really like when he talked about how, in the Middle East, we are arming both sides. And how, when we arm both sides like that, it leads to more fighting,” Adam Demory, a sophomore marketing major at Northern Iowa who was in the audience, said. THIS REPORT IS PART OF AN IOWAWATCH/COLLEGE MEDIA CAUCUS REPORTING COLLABORATION WITH JOURNALISM STUDENTS ON SEVERAL IOWA CAMPUSES. LEARN MORE AT THIS SITE. 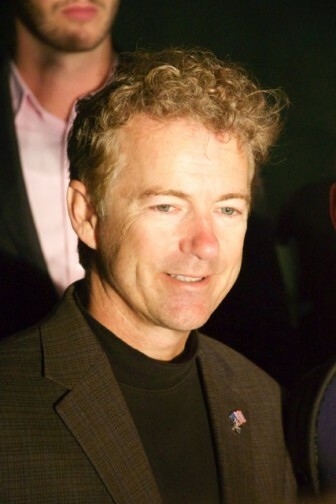 Besides Buena Vista and Northern Iowa, Paul’s tour – called the Iowa 10,000 College Tour – took him to Morningside College in Sioux City, Drake University in Des Moines, Ambrose University in Davenport, Loras College in Dubuque, Upper Iowa University in Fayette, Wartburg College in Waverly, Coe College in Cedar Rapids, Cornell College in Mount Vernon and the University of Iowa in Iowa City. The big question from all of those travels will be: was the trip worth it? Supporters said they liked what they heard but skeptics remained. Paul appears to have difficulty setting himself apart from the other candidates in the crowded GOP field, Drake University junior Ryan Wiskerchen said after Paul wrapped up the tour in Des Moines Wednesday. Wiskerchen is a junior studying for majors in international relations and history at Drake. 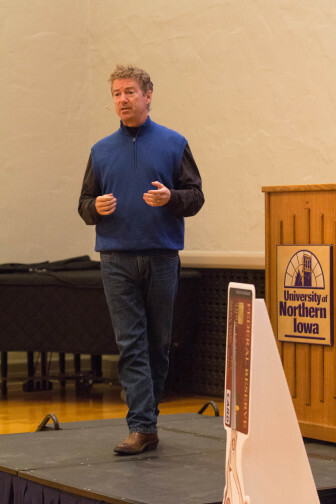 Sen. Rand Paul during his University of Iowa stop Oct. 12, 2015. “His dad was a senator,” said Girres, referring to former U.S. Rep. and former presidential candidate Ron Paul, who never was in the Senate. “He’s not new to this stuff … He grew up in it just like George and Jeb,” a reference to the Bush brothers – one a former president and the other seeking the 2016 nomination. Paul did not engage in a lot of small talk with staffers and students at his evening University of Iowa appearance, on Tuesday, Oct. 12, the first day of the tour but after two nearby campus visits earlier in the day. More than 100 people turned out for that event in front of Old Capitol. Hope Waggoner, a senior in advertising and public relations at Drake University, said Paul needs to be more direct when answering questions and show more of a human side in order to go further in the polls. “He needs to get himself out there more and be more personable,” Waggoner said. IowaWatch’s Danielle Wilde contributed to this report. Iowa Gov. Kim Reynolds said in the latest IowaWatch Connection radio report and podcast that Iowa needs to streamline the process for getting flood relief to portions of the state pounded with spring flooding. The process will include coming up with funds in Iowa to provide flood relief, matching at some level federal aid that eventually comes into the state, Reynolds said in the weekend radio report.